Closing the gap from the Networking Release 2 distribution to a fully functioning system did not take long. Within six months of the release, Bill Jolitz had written replacements for the six missing files. 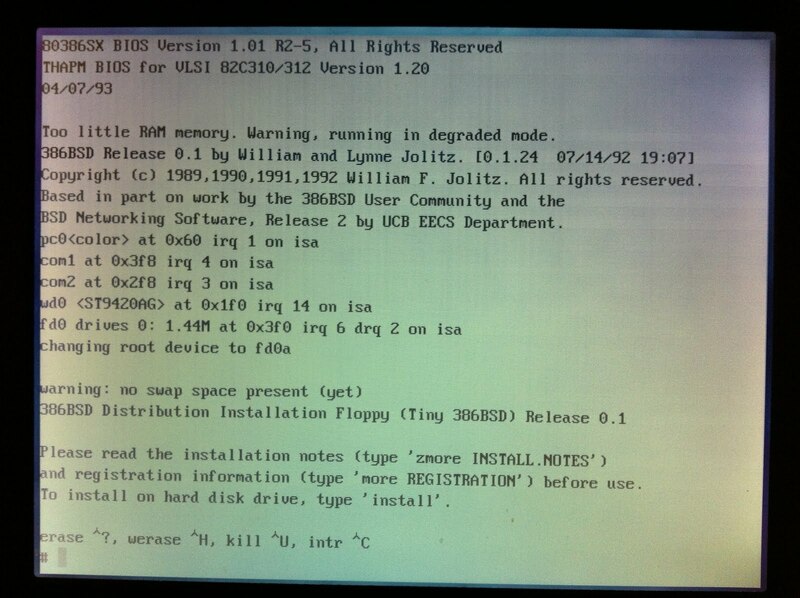 He promptly released a fully compiled and bootable system for the 386-based PC architecture which he called 386/BSD. Make it sound like Bill spent six months on six files. Oh well it’s kind of fun to see things go round and round. Well I was looking for a good way to see what changed between Net/2, 386BSD 0.0 and 386BSD 0.1 and it appears that nobody has a cvsweb of these early versions…. What is strange, is that cvsweb package for debian is lacking the actual cgi file.. So after going insane with cvsweb, I set one up. I also setup src2html to browse various levels, it’s great for quickly finding things that may have moved… It’s here. Now I just have to see about doing ‘forks’ in CVS and adding in the 4.4 lite stuff. Well, ok it’s not 100% the NetBSD 0.8 kernel, as a good chunk of the files have been intentionally removed from CVS. However from the announcement, it does make it clear that NetBSD 0.8 is 386 BSD pl22 with some pre pl23 changes thrown in. Since patch level 22 is lost, however patch level 23 is still around, then it wasn’t to hard to install a 386 BSD system, patch it to level 23, then unpack the NetBSD 0.8 sources, and fill in the missing parts. I guess this is the Jurassic Park of kernels? 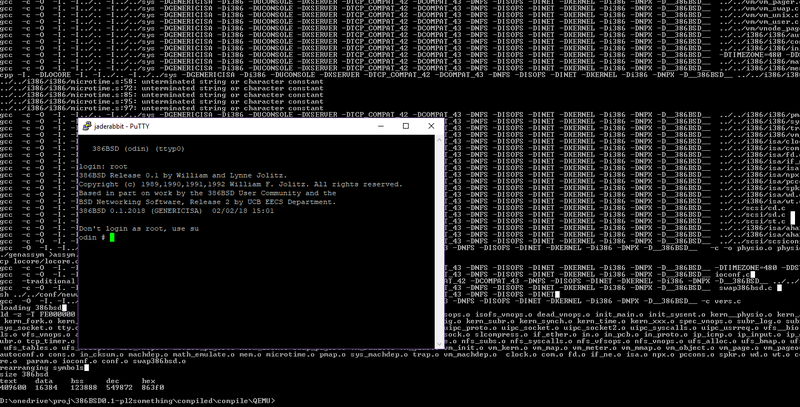 As you can see there is some differences in the boot strings, but at the same time, because so many files were just pulled in from 386 BSD, and I’m still using a 386 BSD userland, it reports itself as 386BSD. Oh well it was moderately interesting. For the insane, the merged source is here. I’ll provide a snapshot of my build environment, under Qemu here. 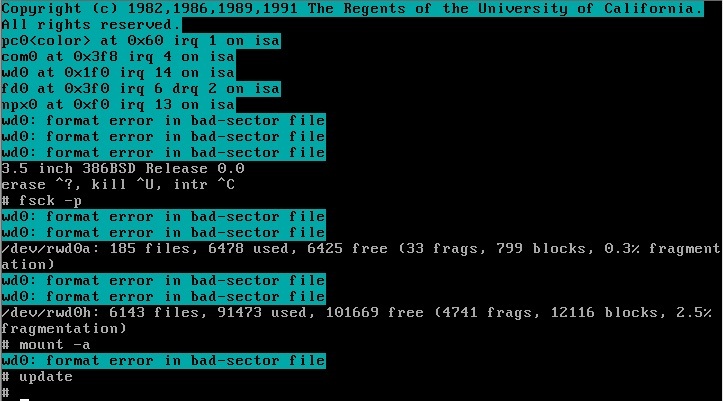 Author neozeedPosted on December 5, 2010 January 12, 2016 Categories 386BSD, netbsd, qemu7 Comments on NetBSD 0.8 kernel boots!